Women who are already losing their hair are more likely to favor these styles as they help disguise the loss, researchers said. Study identified central centrifugal cicatricial alopecia, or "hot comb alopecia"
(Health.com) -- Weaves and braids may contribute to a type of permanent hair loss that appears to be common among black women, a new study has found. More than one-quarter of the 326 black women who participated in the study had hair loss on the top of their scalp, and of those women, 59 percent had signs of central centrifugal cicatricial alopecia, or CCCA, a poorly understood form of baldness that begins at the crown of the head and leads to scarring. For many years, CCCA was known as "hot comb alopecia" because it was attributed to the use of hot combs to straighten curly hair. That appears to be a misnomer. 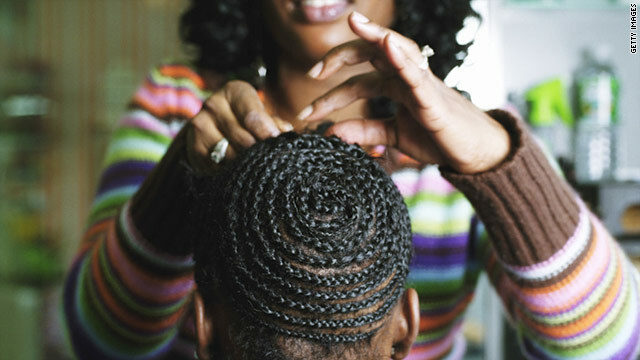 Neither hot comb treatments nor chemical relaxers, which were used by more than 90 percent of the study participants, were linked with CCCA in the study, but braids, weaves, and other so-called traction hairstyles that tug at the scalp were. Black women often maintain these styles for long periods of time, and the stress they exert on the scalp can lead to the development of pus-filled bumps, says the lead researcher, Angela Kyei, M.D., a dermatologist and chief resident at the Cleveland Clinic's Dermatology and Plastic Surgery Institute. "Over time, these bumps can develop bacteria" that can lead to scarring, she explains. Making matters worse, women who are already losing their hair are more likely to favor these hairstyles because they help disguise thinning hair, the study notes. Black women should consider refraining from using these hairstyles on young children, and they need to think about the consequences for themselves, Kyei says. "If you start to notice this type of hair loss, get evaluated early," she urges. The average age of the women with CCCA was 58. The condition often presents itself when women are in their 40s, but it's sometimes seen in women as young as their 20s and 30s. It's not clear from the study that these hairstyles are solely responsible for CCCA, however. Women with the condition tended to have balding maternal grandfathers, and they were also more likely to have diabetes. While only 8 percent of the women overall had type 2 diabetes, 18 percent of those with CCCA did?a "surprising finding," Kyei says. Dermatologist Andrew F. Alexis, M.D., the director of the Skin of Color Center at St. Luke's--Roosevelt Hospital, in New York City, says that more research is needed to confirm a link between CCCA and diabetes. "However, it does suggest that it may be useful for dermatologists to ask their CCCA patients about diabetes and refer them to their primary care physicians for annual screening," he says. In the study, which was published Monday on the website of the Archives of Dermatology, researchers asked women from two African-American churches and a health fair in Cleveland about their medical history, family history of hair loss, and hair grooming practices. Dermatologists trained in hair loss examined the women's scalps and graded them on the degree of hair loss and scarring they exhibited. Raechele Cochran Gathers, M.D., a senior staff physician at the Henry Ford Hospital's Multicultural Dermatology Center, in Detroit, says that the findings, though preliminary, provide good information about a little-understood condition. "I think that the study's excellent because it not only gives environmental factor data, which a few other studies have reported on, but also it's unique in that it's looking at these medical risk factors," she says. In light of the findings, Gathers adds, it's incumbent upon doctors and hairdressers to make women aware of CCCA and the potential link with traction hairstyles.